If you are an amateur or sports professional and wish to enjoy gastronomic pleasures in your life, we invite you to read this article carefully. 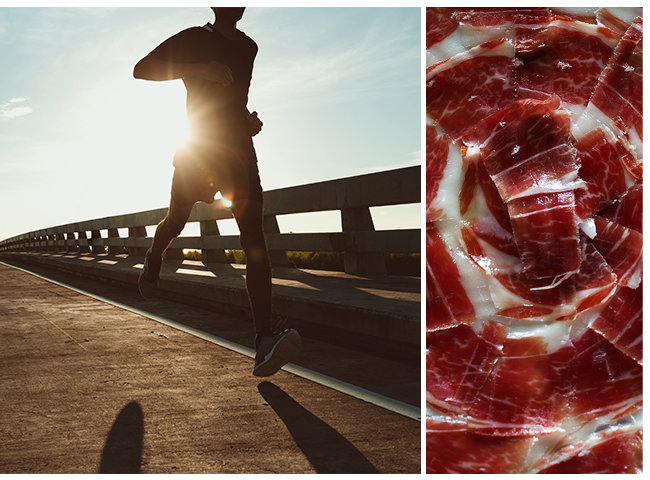 Here we reveal the delight of combining sports practice, personal care and a balanced diet with one of the most delicious and nutritious foods in Spanish cuisine: Cinco Jotas acorn-fed 100% ibérico ham. It’s about time we speak clearly about the nutritional richness of Iberian ham and put an end to false claims in the minds of some consumers. Few foods are as healthy as Iberian ham, especially if the animal feeds on acorns (like all Cinco Jotas 100% ibérico-breed pigs). These nutritional qualities are especially pertinent for athletes, who must follow very specific diets to maintain performance. Let’s talk data to shed some light on this matter. Above all, athletes need foods rich in protein. For every 100 grams of acorn-fed 100% ibérico ham, 35 grams are proteins. That’s a whole lot of protein! We also note that the B vitamins are critical. Vitamin B1, called thiamine, is essential for the proper functioning of the heart and muscles. Athletes look for foods that naturally provide this nutrient, as it affects their daily activities in such a positive way. Iberian ham is one of them: its content in Vitamin B1 is between five and ten times higher than in other meat products. There are also high levels of B2 and B6, which help to reduce fatigue. Oh, and another little something: in each Cinco Jotas slice there are a slew of minerals such as iron, zinc and potassium, all essential for the proper maintenance of muscles. We conclude this mini nutritional journey for athletes with something of interest to all of them: caloric intake. 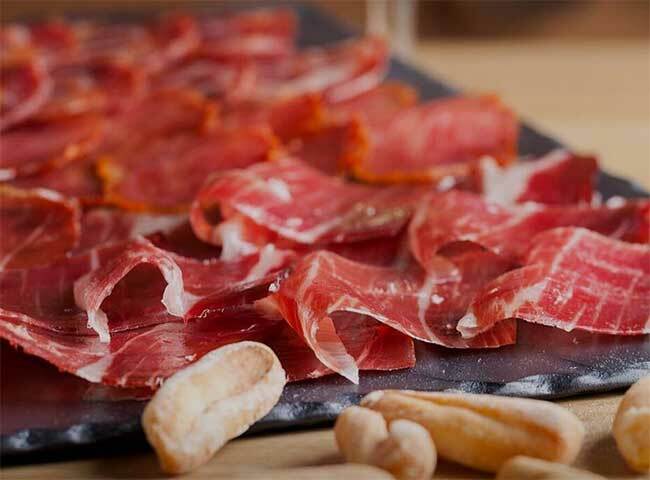 In 100 grams of Cinco Jotas acorn-fed 100% ibérico ham there are less than 250 calories. How can you resist? More importantly, why on earth would you? Cinco Jotas products are rich in monounsaturated fatty acids (the healthy fats) and is a primary source of oleic acid, much like extra virgin olive oil. Effects on your body? It improves blood circulation and helps to prevent cardiovascular diseases. After this master class about Cinco Jotas, sports, health and nutrition, we have just one thing left to say: what time are we training?